Terminator 3: Rise of the Machines Experimental T-101 Torso Screen Used Prop. O riginal Screen used Terminator Model-101 Prototype Torso which was made for the 2003 Sci-Fi Action Blockbuster "Terminator 3: Rise of the Machine" staring. 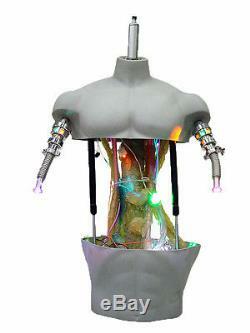 This lifesized android torso is made of plastic with metal accent parts and over 70 LED lights. It can be seen in the background of the Skynet building and the deleted Sergeant Candy scene. This Terminot Torso is in very good condition with signs of production use and light surface damage, all lights are in working conditon. Overall it looks good for a screen used prop! See pictures for more details. 34" Tall 24" Wide 24 Deep. All Vintage and Antique related items are guaranteed to be original period pieces and made by the designer listed. Each item has been appraised and authenticated by one or more antique dealers in the West Los Angeles area. Some items may vary in color or appearance from actual picture. Many of our Modernist items were used as Props in TV and Movies. The item "Terminator 3 Rise of the Machines Experimental T-101 Torso Screen Used Prop" is in sale since Friday, September 7, 2012. This item is in the category "Entertainment Memorabilia\Movie Memorabilia\Props\Originals". The seller is "harveysonbeverly" and is located in North Hollywood, California. This item can be shipped to United States.